The role of routine transversus abdominis plane (TAP) blocks at the time of surgery for Cesarean delivery analgesia is uncertain. Previous studies have shown no additional analgesic benefit in patients receiving intrathecal morphine. We present a series of three cases where TAP blocks were used for rescue analgesia in patients who had severe post-Cesarean delivery pain after a standard spinal anesthetic containing bupivacaine 12 mg, fentanyl 10 μg, and morphine 200 μg. All three women experienced severe incisional pain in the postanesthetic care unit (PACU) after offset of spinal anesthesia. When the pain did not subside with intravenous opioids, the women were offered either additional intravenous opioids or a TAP block. They chose the latter. Bilateral TAP blocks were performed in a sterile posterior approach under ultrasound guidance with 0.375% ropivacaine 20 mL with epinephrine 1:400,000. All three patients experienced significant pain relief that lasted 10-19 hr and allowed for a timely discharge from the PACU. These cases show that TAP blocks may play a valuable role as a rescue analgesic technique rather than as a routine preemptive block for all Cesarean delivery patients. Use of TAP blocks reduced the need for escalating intravenous opioid doses and potential maternal opioid-related side effects. Rescue TAP blocks should be considered after Cesarean delivery when intrathecal morphine does not provide adequate pain relief or for early breakthrough pain after offset of spinal anesthesia. Farheen Mirza and Brendan Carvalho helped with patient care, reviewed the clinical data, and helped write the manuscript. Farheen Mirza collected the clinical data and is the author responsible for archiving the study files. Brendan Carvalho proposed the case series and helped report the data. Le rôle du bloc dans le plan du muscle transverse de l’abdomen (transversus abdominis plane block – TAP block) de routine pour l’analgésie au moment de la chirurgie pour un accouchement par césarienne est incertain. Les études précédentes n’ont démontré aucun avantage analgésique supplémentaire chez les patientes recevant de la morphine intrathécale. Nous présentons une série de trois cas dans lesquels des TAP blocks ont été utilisés pour une analgésie de secours chez des patientes qui souffraient de fortes douleurs après un accouchement par césarienne, pour lequel elles avaient reçu un anesthésique rachidien standard contenant de la bupivacaïne 12 mg, du fentanyl 10 μg et de la morphine 200 μg. Les trois femmes ont souffert de fortes douleurs au site d’incision en salle de réveil, une fois l’effet de la rachianesthésie passé. Lorsque la douleur ne s’est pas amenuisée avec des opioïdes intraveineux, on a proposé aux patientes des opioïdes intraveineux supplémentaires ou des TAP blocks, qu’elles ont choisi. Des TAP blocks bilatéraux ont été réalisés par une approche postérieure stérile sous échoguidage avec 20 mL de ropivacaïne 0,375 % et 1:400 000 d’épinéphrine. Les trois patientes ont ressenti un soulagement important de la douleur d’une durée 10-19 h, ce qui a permis un congé opportun de la salle de réveil. Ces cas démontrent que les TAP blocks pourraient jouer un rôle précieux en tant que technique d’analgésie de secours plutôt que comme bloc préventif de routine chez toutes les patientes subissant un accouchement par césarienne. L’utilisation de TAP blocks a réduit le besoin de doses croissantes d’opioïdes intraveineux et d’effets secondaires potentiels liés aux opioïdes pour la mère. Il faudrait envisager de réaliser des TAP blocks de secours après un accouchement par césarienne lorsque la morphine intrathécale ne fournit pas un soulagement adéquat de la douleur ou pour la douleur aiguë précoce une fois l’effet de la rachianesthésie passé. We present three cases in which bilateral TAP blocks were used as rescue analgesia in healthy patients who had severe postoperative pain following elective Cesarean delivery under spinal anesthesia with intrathecal morphine. All patients described in this case series gave written informed consent for publication of this article. The patients all received our institution’s standard Cesarean delivery spinal anesthetic, which consists of 0.75% hyperbaric bupivacaine 12 mg, intrathecal fentanyl 10 μg, and intrathecal morphine 200 μg. Postoperatively, patients routinely receive nonsteroidal anti-inflammatory drugs (NSAIDs) for 48-72 hr. The NSAID protocol consists of oral ibuprofen 600 mg every six hours or intravenous ketorolac 15 mg every six hours if they cannot tolerate oral medications. All three patients reported in this case series experienced standard intraoperative estimated blood loss (700-1,000 mL). The primary oral opioid analgesic for breakthrough postoperative pain is oral oxycodone 5 mg with acetaminophen 325 mg (Percocet®, Endo Pharmaceuticals, Chadds Ford, PA, USA) and up to 10 mg of oxycodone every four hours. Intravenous fentanyl, hydromorphone, and/or morphine are available for severe pain or pain not responding to oral opioid analgesics. Over the past year, we began offering patients the option of receiving TAP blocks for severe post-Cesarean pain that does not respond to routine analgesics outlined above. Since introducing rescue TAP blocks as an analgesic option, we perform an average of one to two rescue TAP blocks each month for severe Cesarean delivery pain that is unresponsive to standard analgesics. Patients in this case series represent the first three patients to undergo this treatment after the decision was made to evaluate this protocol. All patients in this case series experienced severe pain in the recovery room. Despite being given the standard postanesthetic care unit (PACU) protocol of both oral and intravenous opioids, the pain did not decrease significantly; consequently, TAP blocks were offered to the patients. Bilateral TAP blocks were performed using a classic TAP approach in a sterile manner under ultrasound guidance. Standard monitors (noninvasive blood pressure cuff, pulse oximeter, and three-lead electrocardiogram) were applied prior to performing the TAP blocks. A high-frequency (10-5 MHz) 38-mm linear ultrasound probe (Sonosite L38, Bothell, WA, USA) with an ultrasound machine (Sonosite M-Turbo, Bothell, WA, USA) was utilized. The probe was placed laterally between the 12th rib and the iliac crest. Once all three (external, internal, and transversus abdominis) muscle layers were visualized, a 21-G 100-mm Stimuplex® needle (B. Braun, Bethlehem, PA, USA) was inserted on the lateral edge of the probe. Immediately following, 0.375 % ropivacaine 20 mL (APP Pharmaceuticals, Schaumburg, IL, USA) with epinephrine 1:400,000 was administered bilaterally between the internal oblique and transversus abdominis muscle layers. The concentration of 0.375% ropivacaine used at our institution is based on the dosage by Costello et al.7 Epinephrine (1:400,000) was added in an attempt to prolong the duration of the block. Good spread of the local anesthetic solution was observed. A 31-yr-old G3P2 female with a history of two prior Cesarean deliveries, gestational diabetes, and obesity (body mass index [BMI] 46 kg·m−2) underwent an uncomplicated Cesarean delivery under combined spinal-epidural anesthesia. Total surgical time was 54 min. Sixty minutes after surgery, the patient complained of 9/10 pain (on a numerical verbal pain scale [NVPS] 0-10 with 0 = no pain, and 10 = worse pain imaginable) over her surgical incision, which remained unchanged after she received oral oxycodone 10 mg with acetaminophen 650 mg. She remarked that she did not experience pain in the recovery room after her first and second Cesarean deliveries. On a request by the obstetrician, the patient did not receive NSAIDs because there was inadequate intraoperative uterine tone requiring intramuscular methylergonovine, a small area of bleeding at uterine closure that was repaired by a figure of eight suture, and multiple adhesions between the uterus and abdominal wall limiting uterine exteriorization to look for other sites of bleeding. She was given hydromorphone (total of 1 mg iv) and morphine 4 mg iv, which resulted in some sedation but minimal decrease in her pain score. Bilateral ultrasound-guided TAP blocks were performed as outlined above, and within 20 min, the patient’s pain decreased from a 9 to a 2 on the NVPS. She was discharged from the PACU 62 min later. The patient’s next request for further analgesia was 12.3 hr after the TAP blocks (Table). A 34-yr-old G2P1 female with one prior Cesarean delivery underwent an uncomplicated repeat Cesarean delivery under spinal anesthesia. In the PACU, she complained of sharp incisional pain (10 on the NVPS) 31 min after the end of surgery when her spinal anesthesia block had resolved (no residual motor block or sensory level to ice). She was in severe distress and stated that she had not experienced such pain with her first Cesarean delivery. No NSAID had been administered because of intraoperative uterine atony requiring treatment with intramuscular methylergonovine as well as multiple sites of bleeding on the anterior abdominal wall where adhesions were present. She was initially given oral oxycodone 5 mg with acetaminophen 325 mg and fentanyl 100 μg iv with no decrease in pain. Additional boluses of morphine (total of 12 mg iv) and hydromorphone (total of 2 mg iv) resulted in a minimal decrease in her pain score to 9 on the NVPS. The patient complained of dizziness and sedation after opioids were given. She was then offered and agreed to receive a TAP block. Eighteen minutes after bilateral TAP blocks, her pain score decrease from 10 to 3 on the NVPS. Her next request for further pain medication was 10.3 hr after the TAP blocks (Table). A 39-yr-old G2P1 with a history of ulcerative colitis, for which she underwent colectomy, and one prior Cesarean delivery underwent a routine repeat Cesarean delivery under combined spinal-epidural anesthesia. Surgery was uncomplicated and lasted 56 min. In the PACU, the patient experienced stabbing incisional pain (9 on the NVPS) diffusely over her lower abdomen. She stated that she had never experienced pain this severe with either of her prior surgeries. Due to her history of ulcerative colitis, NSAIDs were withheld to prevent any potential exacerbation or relapse of her disease. She vomited twice and declined oral analgesics for fear of worsening nausea. She received fentanyl 50 μg iv and hydromorphone (total of 2 mg iv) with minimal decrease in her pain score to 8 on the NVPS. She experienced both worsening nausea and increased somnolence with the intravenous opioids. The patient was offered either more intravenous hydromorphone or TAP blocks, and she chose the latter. Bilateral TAP blocks were performed and her pain score decreased within 27 min from 9 to 2 on the NVPS. Pain relief lasted 19.9 hr before she requested further analgesia (Table). Since introducing TAP blocks as a rescue analgesic option at our institution, we have performed approximately one to two TAP blocks per month, and the vast majority of patients receive analgesic benefit. Nevertheless, future studies are required to assess the potential number of patients who may benefit from rescue blocks after Cesarean delivery as well as the overall analgesic benefit attained from these blocks. 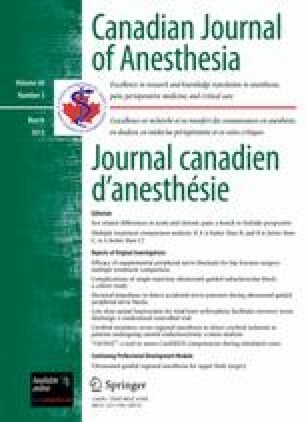 While prospective randomized controlled studies are needed to prove the utility of TAP blocks for rescue analgesia in the Cesarean delivery setting, study design might prove particularly challenging, and we may need to rely on case series and clinical experience for “proof” of analgesic efficacy for rescue analgesia. Although these cases show the utility of offering TAP blocks when pain is unresponsive to intravenous opioids and analgesics, TAP blocks could also be considered as an alternative to intravenous opioids to manage breakthrough pain in patients not receiving intrathecal morphine and/or when NSAIDs are contraindicated. With intrathecal morphine 200 μg combined with multimodal analgesia (NSAIDs and acetaminophen) we would expect approximately 5-10 % of patients to require intravenous opioids or have severe pain that is difficult to manage.18,19 Worth mentioning, all three of the patients reported here did not receive NSAIDs postoperatively because of concerns with bleeding. At our institution, the obstetricians may withhold postoperative NSAIDs because of continued localized bleeding in the surgical field, uterine atony or inadequate uterine tone, and any medical condition in which NSAIDs are contraindicated. The type of analgesia provided by NSAIDs has been shown to be directed against the visceral cramping pain occurring after Cesarean delivery;20,21 however, all three patients complained of predominantly somatic incisional pain (as opposed to visceral pain) for which TAP blocks are particularly indicated.8-10 The analgesic efficacy of TAP blocks for these three women indicates that the pain was likely predominantly somatic incisional pain. Differentiation between incisional and cramping pain is important before offering TAP blocks as a rescue analgesic technique, as visceral pain from the uterus will not be adequately treated with TAP blocks. These cases highlight the potential opioid-sparing effects of TAP blocks and the likely prevention of more opioid-related side effects in both the mother and the breast-feeding infant. A significant limitation of a single-shot TAP block is the duration of analgesia. Although the duration of analgesia in these cases was limited to 10-19 hr, it was significantly longer than the six hours reported after single-shot rescue TAP blocks for non-Cesarean abdominal surgery11 and did facilitate discharge from the PACU. A recent case report suggests a role for continuous TAP blocks following Cesarean delivery;22 however, there is a need for randomized controlled studies to confirm the utility of continuous TAP catheters following Cesarean delivery. In conclusion, these cases highlight a potential indication for TAP blocks to manage breakthrough pain after offset of spinal anesthesia following Cesarean delivery. In light of literature that shows limited efficacy for routine TAP blocks at the time of surgery in patients receiving intrathecal morphine and multimodal analgesia, the proposed rescue analgesic indication may be the optimal role for TAP blocks in this setting. With TAP blocks, there is a potential to reduce the need for escalating intravenous opioid doses and the associated opioid-related side effects. While these cases clearly highlight the analgesic efficacy of TAP blocks to treat breakthrough pain, future prospective studies are required to provide a better outline of the utility of TAP blocks for rescue analgesia in the Cesarean delivery setting. This case report was funded internally by the Department of Anesthesia, Stanford University School of Medicine.